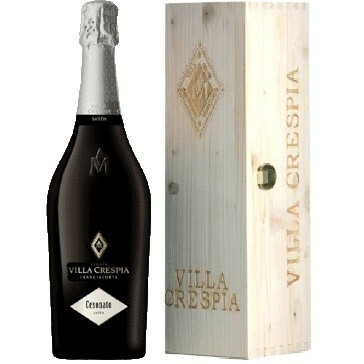 Cesonato: a great Franciacorta Saten, magnum size, comes in a beatiful wooden box! 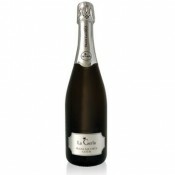 In the past, Cesonato was the term used in Franciacorta in reference to farms that were protected by hedges and woods. Among Tenuta Villa Crespias's properties, the Ai Prati, Favento and Novali vineyards are situated at the highest altitudes among stands of chestnuts typical of the zone. The terrains are morainic in origin, not very deep and with stones carried down by floods. Chardonnay ripens here in conditions that preserve its more delicate and elegant floral fragrances. 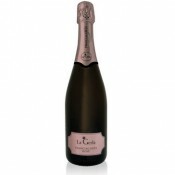 THis wine is made with Méthode Champenoise, 10% of the must is fermented in barriques, refermentation takes place in the bottle for 24 months with selected yeast of the estate, it is a Saten with 9 grams per liter of residual sugar. The Archipelago Project, launched in 1999 by brothers Bruno, Diego, Giuliano and Giorgio, transformed the Muratoris’ aspiration to produce wine from grapes grown in their own vineyards into a major financial investment. A meeting with winemaker and oenologist Dr. Francesco Iacono – at that time researcher at the Agrarian Institute of San Michele all’Adige – marked the beginning of the venture. In January 2000, Francesco Iacono took over as General Manager of the newly established Fratelli Muratori Wine Estates. Then began the process of identifying areas or “islands” in four Italian territories that are particularly well-adapted to wine-growing and ideal for transforming the Archipelago Project concept into reality. The project is based on four “islands”: Franciacorta, the family’s choice and place of origin; the municipality of Suvereto in the Maremma area of Tuscany; Sannio, in the municipality of Benevento; and the island of Ischia in Forio. This choice of territories is centred on the concept that a wine should not simply be the result of a cultivation and vinification process, but should express the wealth of experience and tradition accumulated over centuries, historical and philosophical values that must live on into the future. 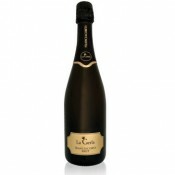 Like all spumanti this isn't a wine that should be aged and is best drunk within two or three years of purchase at the latest, the bottles should be laid horizontally in a cool, dark, humid wine-cellar. In order to appreciate this wine at its best the bottle should be taken out of the cellar and immersed for about half an hour in an ice bucket, the ideal temperature to drink this wine is 7-8 degrees centigrade, the bottle should be carefully uncorked making sure the wine does not gush out, the best glasses to use are clear, transparent crystal flutes.